Location: NE of Birmingham, minutes from I-20 and I-59 in Ashville, AL. From interstate 20, exit #158, turn north on US 231 to Ashville. From interstate 59, exit #166, turn south toward Ashville on US231. Facilities: Gorgeous, quiet, & private, deluxe boarding facility. 12' x 12'stalls with thick rubber mats. Temporary pasture board can be arranged. 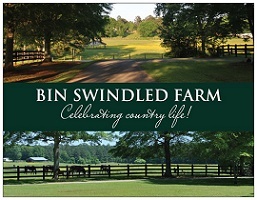 Owners live on property and both are expert in equine care and management - former USPC horse management and rancher. 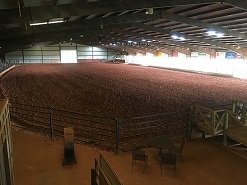 200' x 150' riding arena. RV hook up available. Location: We are conveniently located only 8 miles off of I-20, 20 miles outside of Birmingham between B'ham and Atlanta; 100 miles outside of Atlanta. We are also only 10 miles of Highway 280. Our ease of access as well as quiet country location will appeal to all equine travelers. 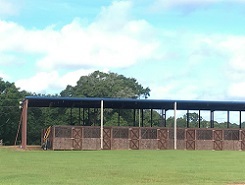 Facilities: Stalls (116), RV hook ups (42), wash racks, covered arena (125' x 250'), 3 outdoor arenas, perimeter fence to ride on, 3 miles of trails to ride on, obstacles. In 2019 we will be adding campers for people to stay in. Facilities: Horses love it here! Quiet horse haven located 20 minutes from downtown Montgomery, AL. Conveniently located off I-65. Gated entrance. Stall board and/or pasture overnight board. Owners live on the property. We pride ourselves on providing quality horse care. Located on 132 acres. Location: 7 miles off of I-65.Very convenient to downtown Montgomery and Maxwell AFB. Exit 164 has several hotels and motels for overnighting. You may leave your trailer here while you explore the area. 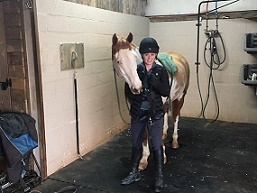 Facilities: Beautiful boarding facility with 12'x12' stalls. 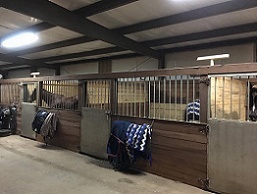 Lighted arena and round pen available for exercising horses, as well as possible use of pasture. Feed and hay available. Conveniently located about 3.5 miles off I85 just outside of Montgomery. Location: Outside Montgomery in Pike Road, AL. Travel N on I-85 toward Atlanta. Exit at Waugh on Exit 16, and turn right on Marler Road. Travel approximately 3.5 miles and turn left on Chaseway. Pass two houses on your left and turn left on Seven Oaks Rd. The barn is straight ahead. 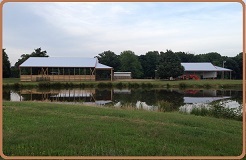 Facilities: Trailer hook-ups, covered stalls, 100' x 200' covered arena, turn-outs, RV hook-ups with plenty of room for trailer and vehicle parking. Lodging is available for humans; no pets in the room, please. Location: 5 minutes off of Interstate 20/59 exit 62. Halfway between Birmingham, AL and Meridian, MS. Great setting for relaxing & riding. Location: Located just 20 minutes south of Interstate 10 near historic Fairhope, Alabama on the eastern shore of Mobile Bay. Facilities: Overnight stays for up to 4 horses. RV hook up available with 30 amp. circuits. A room that sleeps 4 is available. It has a full bathroom with hot shower. A patio and dining area with a BBQ is provided. An arena is available. Call 256-476-8335 for availabillity and rates. Location: Conveniently located half-way between Birmingham, AL, Nashille TN, and Memphis TN. Just minutes away from Interstate 65 and Alabama Highway 157.